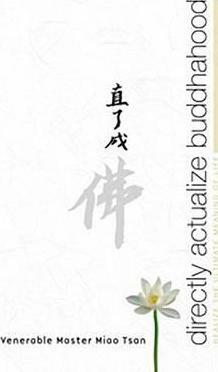 The fourth book in a series by Miao Tsan, Directly Actualize Buddhahood presents the universal path of wisdom and light in the context of religion. Religion is the container of ancient knowledge; it constitutes the understanding of life s fulfillment. However, as this knowledge was been passed down through generations, its essence and value have been contaminated across a spectrum ranging from prejudiced disbelief to blind faith. Understanding our beliefs is an important step towards enlightenment, because what we believe determines what we will do and create, and the situations we will inevitably encounter. Amid the eternally unfolding process of life, a most important lesson is to discover which kind of belief will lead us to light. To complete this lesson, we must first understand the meaning of life. This is not a meaning we define for ourselves, however. The meaning of life is truth. Venerable Master Miao Tsan attempts to guide each seeker toward a deeper understanding of the source and essential nature of our present situation, so that inner change can occur at the fundamental level, we can overcome our self-imposed limitations and create a better life."